Philips headphones offer iPod/iPhone control | What Hi-Fi? 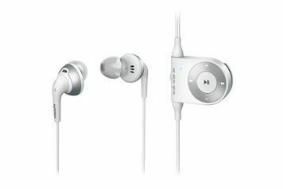 The majority include in-line iPod/iPhone control and a microphone which allow users to answer calls, pause music and change the volume without having to remove their iPhone or iPod from their pocket (iPod-only control on the noise-cancelling SHN6000). The flagship SHN6000 (£90) has built-in noise cancellation, which Philips claims will cut out 90 per cent of external noise when listening on a train, plane or bus, for example. Power for the noise cancelling is taken directly from the iPod, so there's no need for a chunky battery compartment or a steady supply of batteries. For sports fanatics, the SHS8005 model (£45) hooks over your ears so they won't fall off when you're jogging or down at the gym. And if you prefer over-ear designs, the SHL8805 (£50) has 40mm drivers to deliver "clear and powerful sound" and comes with interchangeable caps in different designs to fit over the ear pieces.